Swindon boxer Jamie Cox says he wants to win multiple world titles after being handed a WBO title eliminator against an as-yet undecided opponent. Cox, 29, has won all 20 of his fights to date, with 12 coming by knockout. 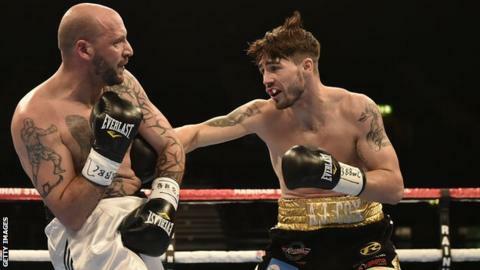 "Any of the four main bodies - the WBC, WBO, WBA and IBF - any of those four I will target, and not just target, I want to win," he told BBC Wiltshire. "I've been in the ring with the best fighters with 16-ounce gloves on in the division so I know what I can do." Cox, who won a gold medal at the 2006 Commonwealth Games as an amateur, also said he has not had any indication who his next fight will be against. "I'll be leaving that with [promoter] Frank Warren and obviously Frank will have some news for me very shortly," he added. "At the end of the day all I have to do is prepare myself with my coach, my team and just be in the best possible shape I can be to deliver the best possible performance." Read more on Frampton v Quigg: Where will it sit among the best all-British fights?